Gas Extraction, Hydraulic Fracturing is here BIG TIME. We are sitting on the largest gas reserve in the United States, Monterey Shale. PXP, an independent oil and gas company primarily engaged in the activities of acquiring, developing, exploring and producing oil and gas is operating in San Luis Obispo. Plains Exploration & Production -PXP- is currently contracted to build a water recycling plant in Arroyo Grande. PXP holds a 100% working interest in the Arroyo Grande Field located in the Santa Maria Basin in San Luis Obispo County, California. They have 350 permits in the works to dump unregulated toxics into the creeks and groundwater. Contamination of the groundwater is inevitable. Groundwater is the lifeblood of a community. There is no cure for Contamination. You can’t un poison a well. We will post your name on the site unless you specify otherwise. We are grassroots. This is where it all begins. How long it takes depends on you. 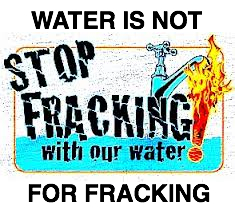 This entry was posted in All, Mission and tagged abolish fracking, Fracking, right to clean water. Bookmark the permalink.